Plain Swift is known to breed on the Canary Islands and Madeira in the north-east Atlantic. The populations on these two Macaronesian archipelagos have always been suspected to be partly migratory, with an unknown proportion of the breeding population departing the islands during the winter months. Infrequent sightings in Morocco and Mauritania have previously suggested that coastal north-west Africa might be a likely winter destination for migrating individuals, but a new study has suggested the birds travel somewhat further. The status of Plain Swift in Morocco is still unclear, although it is thought to be breeding regularly on the coastal cliffs between Agadir and Essaouira. Breeding in these areas, especially north of Agadir, has been suspected for at least since two decades, and a breeding colony was found during a recent study of breeding Northern Bald Ibis. 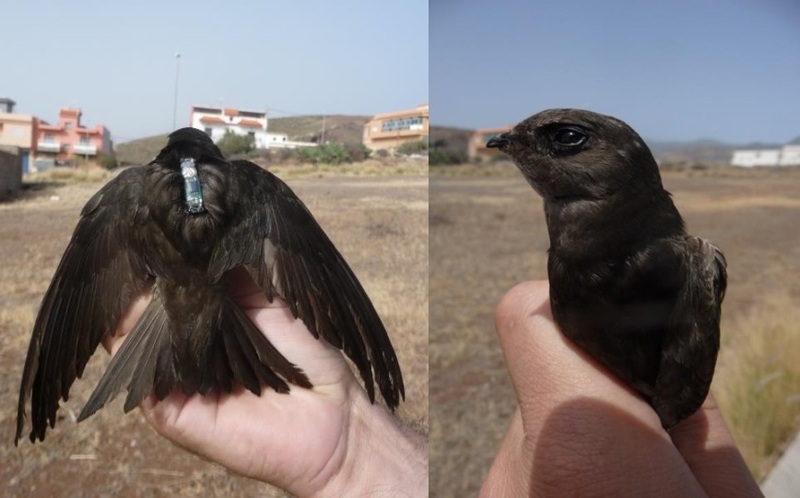 To find out where Canarian Plain Swifts overwinter, Tristan Norton and a team of researchers fitted 16 swifts with geolocators at two breeding colonies on Tenerife in July 2013. Of these birds, two were subsequently recovered at one breeding colony the following May. Plain Swift 'H001', El Tablero, Tenerife, Canary Islands, 9 July 2013 (Norton et al). The data recovered from the two swifts demonstrated that at least some Canarian Plain Swifts undertake substantial migrations to spend the winter months in the Upper Guinean forests of equatorial West Africa. The birds' migratory route included passage through several countries with no previous records of the species, including Senegal, The Gambia, Guinea-Bissau, Guinea, Sierra Leone and Ivory Coast. The birds departed the Canarian breeding colony in October and November respectively and travelled at least 2,600 kilometres to wintering grounds within eastern Liberia and adjacent areas. 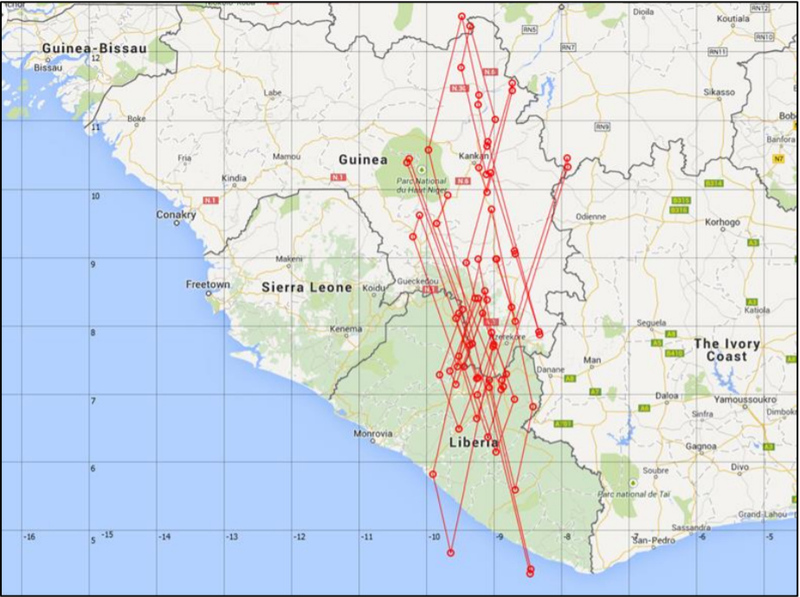 Both birds spent the entire wintering period in the Upper Guinean forests of Liberia, Guinea and Ivory Coast before returning to Tenerife via overland routes through western Africa in March-April 2014. The total time spent outside the Canary Islands was 195 days and 187 days respectively. One bird made several abortive attempts at spring migration, travelling from Liberia to the north-west African coast and back three times between 1 April 2014 and its final return to Tenerife on 2 May. Although this study has confirmed the wintering grounds of some Canarian Plain Swifts, the sample size of two birds is limited. The researchers concluded that a larger sample size, ideally comprising birds from various locations within Macaronesia, is needed in order to investigate whether the Upper Guinean forests do indeed comprise the main wintering grounds for this species. Further study will also allow investigation of any variations in wintering areas as well as any differences between years. 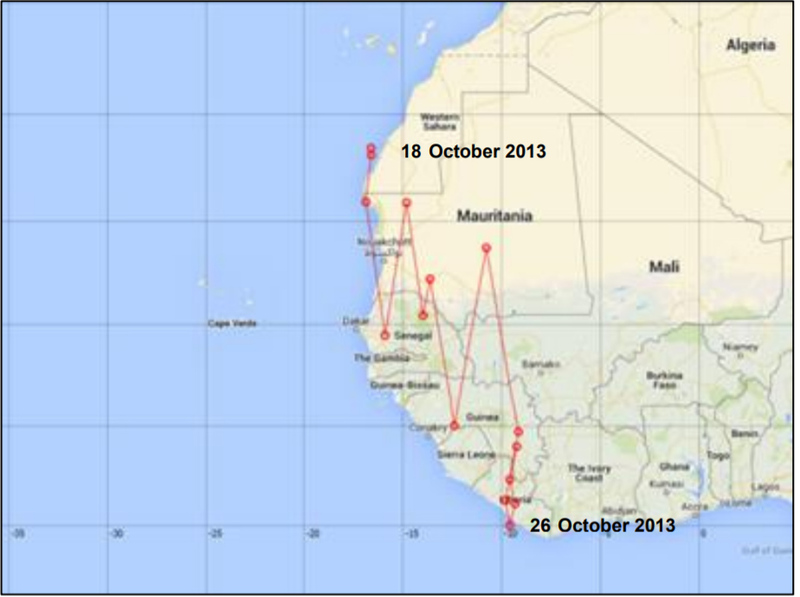 Migration route of Plain Swift 'H001' across multiple West African countries in October 2013. Positions of Plain Swift 'H001' in east Liberia and south-east Guinea in November 2013. Norton, T, Atkinson, P, Hewson, C & Garcia-del-Rey, E. 2018. Geolocator study reveals that Canarian Plain Swifts Apus unicolor winter in equatorial West Africa. African Bird Club & Sociedad Ornitologica Canaria. 15 pp. PDF available online. This article has been adapted from materials originally published on the MaghrebOrnitho website.